100% Awesome and Free Downloadable “Sticker Robot” Paper Toy! Salazad is an amazing Indonesian Paper Artist who loves Sticker Robot. We are Sticker Robot and we are loving an amazing Indonesian paper artist named Salazad. So, please feel free to channel your inner mad scientist, Download our Robot, break out the scissors & glue and make some Sticker Robots of your own! And make sure to swing by Salazad.com to peruse hundreds of other awesome paper toys. 1. Download & Make a Sticker Robot of your own. 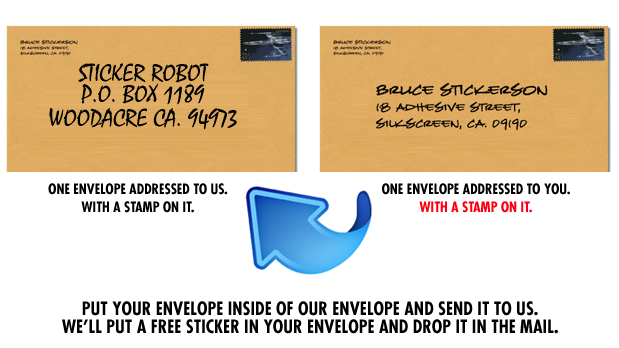 Take a (good) photo and email it to us, along with your mailing address and we will send you some mini Sticker Robot Stickers! 1a. Send an S.A.S.E. * to this address and we’ll drop some in the mail for you. 2. Share this post with your friends & Leave a comment below! We want to spread the word on this Awesome project!